Pro pack 1 player, at least silver 88% 10% 2% 0.00% We sometimes make ultragolds available in the draft during special event weeks. They increase to 0.1% then, taking odds away from silver. Ace pack 5 players, all at least silver 88% 10% 2% 0.00% At least one gold every 10 cards. If you have only one location fully unlocked, you have a 1/10 chance of getting a roomie from that location. Once you open a second location, you have a 1/20 chance of getting one of the roomies. Unlock all 6 locations and you have a 1/60 chance of any specific roomie. The odds do not alter as you acquire more roomies, there is no better chance of getting a roomie you don’t own after multiple duplicates. Limited Edition Epic Masters cannot be first obtained via chests. These are the odds of rewarded Epic Masters being Limited Edition. For each card pack type there is a defined number of cards with minimum awards declared. For each of the 5 types of card pack, one of the potential outcomes listed is chosen at random when opened. Individual cards within the rarity levels have no probability weighting, all are equally likely to be drawn. Note that Event Lockboxes are an exception – these give you parts regardless, but the blueprint is still required to build the weapon. Weapons must be unlocked before they can be found in lockboxes, so the chance to get parts for a particular weapon changes as the player unlocks more weapons. The table below shows the chance to find parts for each weapon, assuming the player has unlocked all weapons. Chances stated in the below table are for a single draw, and the smallest lockbox contains 4 draws, so the chance to find these parts in a lockbox is actually much higher. Please refer to the dynamically updating chances on the lockbox info screens within the game for the most accurate data, which takes into account what the player has currently unlocked. One lockbox consists of multiple ‘draws’, so the percentage chances displayed on the lockbox details screen add up to more than 100%. Chances displayed are for the smaller box, as that is the worst case scenario. The table below shows chances to draw treats (used to unlock and upgrade specific companions) from a single draw in the companion lockbox. Chances listed below assume the player has access to all companions from limited time events, which are only available from lockboxes if gained during events. 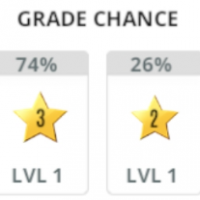 One lockbox consists of multiple ‘draws’, so the percentage chances displayed on the lockbox details screen in-game add up to more than 100% (and are higher than shown here). A newly bred horse’s possible grades are determined by its parent’s lowest grade and the tier of the breeding stall it’s bred in. The percentage chance it will be either of the displayed grades is determined by the difference between both parents’ grades and the tier of the breeding stall it’s bred in. The most accurate representation of these values can be seen in the breeding screen while playing the game (like in the example to the right). A newly bred horse’s level 1 stats are determined by its parents’ level 1 stats and always fall within a set range (shown below). A newly bred horse’s coat colour dilution and pattern are determined by its parents’ coat colours dilutions and patterns. Each reward on the rose wheel gets removed after it has been won. Every reward will be won when the wheel has been spun 10 times.